My children have been actively following the presidential primaries this year. They have really been interested in the various candidates. 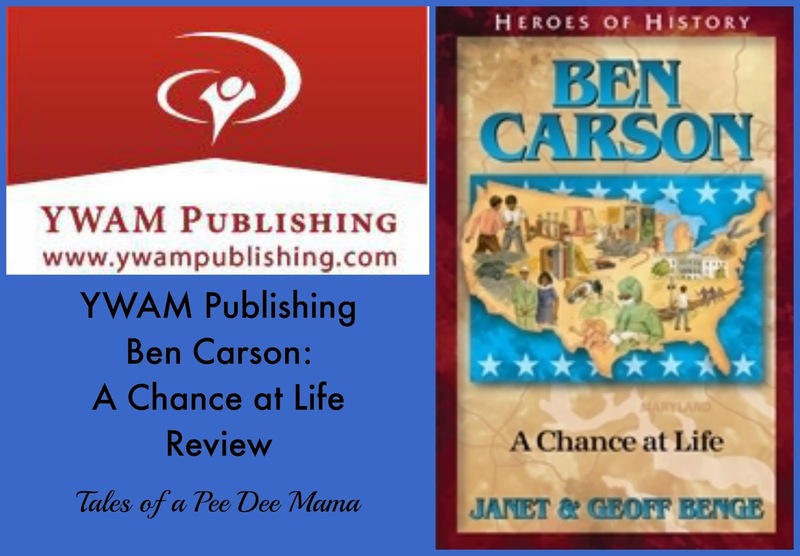 They (and I) were very excited to learn more about Ben Carson through YWAM Publishing's historical biography, Ben Carson: A Chance at Life - A Heroes of History Book with accompanying digital unit study curriculum guide. Ben Carson: A Chance at Life is one of the books in YWAM Publishing's Heroes of History. Last year we had the opportunity to review Laura Ingalls Wilder: A Storybook Life, another of the Heroes of History books. Since Ben Carson was a part of the Republican race for the presidential nomination, it's probably safe to assume that most people are familiar with who he is now - a leading pediatric neurosurgeon with political aspirations. There was a TON of information about Dr. Carson's life in this book, however, that I was not aware of before the girls and I used this as our daily read-aloud book. For example, Dr. Carson was raised by a single mom who played a significant role in pushing him to achieve his goals. He also struggled at a young age with being called dumb by his classmates because he was at the bottom of his class. Other struggles he overcame included racism and an explosive temper. The girls and I really enjoyed getting to know more about the man we have come to admire over the past year as we followed his presidential campaign. Now let me share about the accompanying study guide. First of all, there are 2 unit study PDF files. One of them contains a fill-in-the-blank fact sheet about Ben Carson, maps of Michigan and the Northeast United States, and a blank timeline with a list of events from Dr. Carson's life for students to place on the timeline. Key Quotes - This section contains seven quotes by various individuals that can be used to discuss how it is relevant to the life of Ben Carson. Display Corner - This contains suggestions for items to put in a display corner that represent Dr. Carson's life. Chapter Questions - One of my favorite sections, this contains both factual comprehension questions as well as open-ended opinion questions. After reading each chapter for our read-aloud, I would ask the girls questions from the study guide. The factual questions helped me gauge how well they were understanding what we read, and the open-ended questions really did open up some great discussions, especially with my older girls. Student Explorations - This is my other favorite sections since there are so many great activities found here. There are suggestions for essay/research topics, creative writing, hands-on projects, audio-visual projects, and arts and crafts. Community Links - This section has a list of suggested field trips and people/professions that you could invite to speak to your group or class or that you could interview that correlate to the study of Dr. Carson. Social Studies - This section is divided into 5 categories for an indepth look into social studies - places, terms/vocabulary, geographical characteristics, timeline, and conceptual questions. Related Themes to Explore - This contains a spoke diagram with an extensive list of related themes for cross-curricular learning. Culminating Event - This has suggestions for fun ways to finish up the study. There are also PDF files for how you can best use the Heroes of History books and study guides in a homeschool, a group (like a book club), or a classroom setting. In the file for using the books in a homeschool setting, there are suggestions for using the Heroes of History books as your core curriculum or to supplement other curriculum. I love that there is enough quality history and activities that I could completely use several of these books to create our own history for a year. Are you interested in what others have to say about YWAM Publishing? Check out more reviews from the Homeschool Review Crew.